Because this isn’t creepy at all… right. It’s not enough that Lois Lerner and Hillary Clinton destroyed evidence, but now the NSA is giving lessons on destroying hard drives. Since when is the NSA in charge of Earth Day? The graphics are crappy and the message is even crappier. As Gateway Pundit put it, just because they spy on every call/email/text/credit card transaction doesn’t mean they can’t be good stewards of our environment. Congressional investigators looking into the missing hard drives of Lois Lerner and her IRS colleagues may want to visit the National Security Agency. At 1:10 of the video (which could not be embedded), computer hard drives can be seen going up a conveyor belt into a machine where they are pulverized. The end result is bent metal and shards of plastic spewing out from the other end. Did we just witness the first sighting of Lois Lerner’s long-lost hard drive? IRS Commissioner John Koskinen had told Congress last year that Lerner’s hard drive “was recycled and presumably destroyed,” according to the Washington Times. 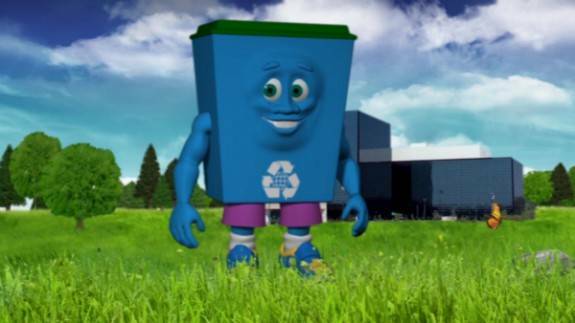 “Now, you may be asking yourself, ‘Why do we need to be keeping our stuff out of landfills?’” the mascot says in the video. Why is a spy agency creating a video on recycling intended for school children and urging them to conduct a “waste audit” in their school? If anything (assuming for a moment there’s even a role for the federal government), wouldn’t that fall under the purview of the Environmental Protection Agency or the Department of Education? Has the federal bureaucracy grown so vast that there’s an unavoidable duplication of missions? And shouldn’t the NSA be focusing on subverting terrorists and not fretting about banana peels in a garbage can? It’s unclear how much the NSA spent to produce the videos or how many personnel resources will be devoted away from catching terrorists to focus on managing the “waste audit” recycling program. Got to teach kids early on how to spy on people and turn them in – that’s what this S.T.E.M. Program Challenge Project looks like to me. ‘Audit’ means investigate, report on and turn in those at your school that are wasteful. Instead of brown shirts, welcome the new green shirts… in the end they are all red anyway. You know, if we have to live down the rabbit hole, can’t it at least be a decent alternate reality without moonbat Progressives? I thought the NSA was supposed to be stopping terrorists and bad guys, not monitoring our trash. Silly me. Here’s an abbreviated version of the video on YouTube targeted towards schoolchildren.